Based on degree-day accumulations and pheromone trap captures in non-managed orchards, codling moth and oriental fruit moth both remain active in the mountains (Henderson County), but populations appear to be low in many managed orchards. In most situations, a single insecticide application targeting codling moth will likely be sufficient, but all decisions should be based on trap captures in individual orchards. As noted last week, first generation brown marmorated stink bug (BMSB) adults are active in lower elevation orchards including Burke, Lincoln, and Cleveland Counties. In those orchards with a history of BMSB damage, insecticide sprays should be applied at this time. This would include products containing pyrethroids or Venom/Scorpion. In higher elevation orchards (e.g., Henderson County), the BMSB degree-day development model is predicting first generation adults to begin emerging later this week. In fact there was a slight uptick in pheromone trap captures this week, suggesting some emergence has started. To avoid damage on the most susceptible cultivars, insecticides targeting BMSB should begin at your next sprays. Finally, there was large emergence of apple maggot in our abandoned site in Henderson County this week, with 23 flies captured. Apple maggot emergence times can vary considerably within a region due to microclimate effects, but for those growers not trapping and unsure of maggot activity in their orchards, an insecticide effective against this pest should be made at this time. 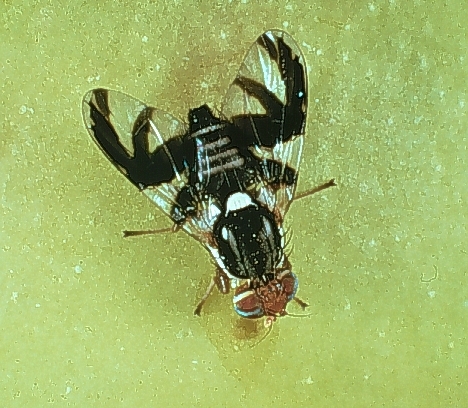 Pyrethroids applied for BMSB will also provide protection against apple maggot. If not applying a pyrethroid for BMSB, imidacloprid (Admire or generic products) will control apple maggot.